Envisage a picturesque Wasatch mountainside home… the serenity, views and vast, wide-open space. Peace and quiet typically requires a trade-off in the form of a remote location but this six-bedroom, six bathroom Cottonwood Heights home boasts all of the above, plus it’s only a five-minute drive to nearby shopping, and a large hop and a few skips to World-class ski resorts (Alta, Snowbird, Brighton and Solitude). You’re so close to the powder you won’t even cross a stop sign, while cosmopolitan Downtown Salt Lake City is a convenient 20-minute drive away. As you enter the home, the lounge room is where you’ll want to linger longer, with its inviting picture window, feature floor-to-ceiling fireplace and thick, soft sink-your-toes-into coir carpeting – capable of withstanding all kinds of traffic. Venture across the open concept area from living to dining and notice the change in hue from the lounge room’s warm mustard color to a cooler sage green. White accents and warm timber flooring imbue the dining, living and kitchen with a calming, serene and elegant ambience. The color palette used throughout the home is elegant and soothing – light mustard, sage green, lavender and baby blue are all complemented by high gloss white accents, including plantation shutters in some rooms and timber flooring and doors for rustic warmth. This property is brimming with unique features, particularly if you appreciate custom woodwork, as you’ll notice in the floor-to-ceiling herringbone fireplaces, sectional doors, sliding/concertina closets and the timber decked balcony. If your tastes lean to classic styling, you may just drop to the laundry floor when you spy the floor tiling. All hail the antique tile. The master bedroom is truly stunning and more akin to a ballet studio, with vaulted ceilings and natural light streaming in from every angle, highlighting the warmth and character of the feature floorboards and floor-to-ceiling herringbone fireplace. An expansive built-in wardrobe has been ingeniously positioned, dividing the enormous master suite into a sleeping area and private retreat to laze by the fire and revel in the picturesque surrounds, that’s IF you’re not luxuriating in the sublime, square-shaped porcelain tub with stainless steel fixtures. The home’s layout includes a mother-in-law apartment with a large, self-contained kitchen to comfortably accommodate a large family, regular visitors or as a potential sublet. You could optimize all 6,126-square feet of space and offset your mortgage with long-term tenants or short-term stay listings via the likes of online accommodation websites such as Air BnB. Low-maintenance landscaping includes a sloping quarter-acre lot, mature trees, three-car garage with plenty of driveway parking, and a partly finished basement with one timber-clad, carpeted room with glass sliding doors – the perfect gym. The backyard is modest in size with two concreted patio areas, tall timber fence and plenty of mature trees for privacy whether on the ground or top floor. Opportunities such as these rarely present and when they do, they’re snapped up quickly. 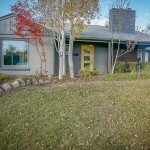 Call Sean at the Muve Group on 801.913.3790 to view your majestic mountain hideaway.